Simple, easy to start and oh, so profitable. Start a business courier service literally in less than a week. And, it won’t cost you an arm or a leg. 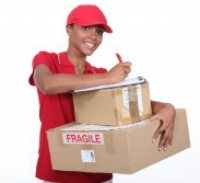 Another factor that draws entrepreneurs to a courier service business is the demand for such services. Many businesses need legal papers, contracts, packages and special items delivered today, right now, but do not want to send an employee because of their workload, wage cost and increased liability insurance cost. Also, retailers and small businesses, which have multiple locations within an area, often need intra-business transferring of items between locations. When she lost her job, all she had to her name was a smart phone, a 3-year old mini-van (totally paid off), her rent paid for the next 23-days, a computer tablet and about 4-months of living expenses. She got the idea for a business courier service when her friend asked her to pick up and take a package across town, as a favor. This was about 8-months ago. I recently had a SKYPE call and asked how she started her company. Rosemary said she just decided to jump in and start a delivery service. She did no courier service business plan. She just winged it. Here is what she did. She went to the telephone book and the Internet to find her competition. If rates were not displayed on their website, she called and asked multiple questions about rates including any rate discounts for yearly contracts with companies. She studied her competitor’s websites to what courier delivery services were offered and what each competitor specialized in, if anything. She set her rates in the middle of the pack even though she was going to give discounts initially in order to “get the business.” She figured, some income is better than little or no income. She spent about $314 for business cards and a full color tri-fold brochure. She had her mini-van wrapped with her company name, logo and cell telephone number. It cost her $281. Then, she hit the road, cold calling on companies, asking for their business. Her approach was essentially to ask the following questions of each company contact. Do you use a business courier service? If so, what’s the one thing that bugs you about them? How often do you use this service? Under what conditions that best suit you, would you try my new business? I want your business and will do everything I can to perform responsibly for you. Will you give me a try? In the beginning she had no designated delivery geographical area. She just wanted to get her feet wet. Within 2-months, she said she had eleven companies sign up averaging about 8 deliveries per day. After 6-months in business, 9 more companies and an average of 16 deliveries per day, she decided to split the city into zones with certain fees applied to delivery between zones. Today, Rosemary has two part time independent contractors making deliveries with her. She is spending more of her time getting new business. She just signed up with Solo Build It to help her build a website that will rank at the top in the search engines. She searched the Web looking for a company that gave proof that their methodology works in achieving a high ranking. She is optimistic! After 8-months, Rosemary is profitable and even paying herself a small salary. Thank you for visiting Start a Business Courier Service.